I really like the idea of sailing East to Europe. I thought starting our trip in Western Europe might be the best plan, since the kids have things they’d like to do there and since it is famously expensive and our budget will be fresh. I also thought we should cross the Atlantic early, since so much can be accessed by land once we are there. 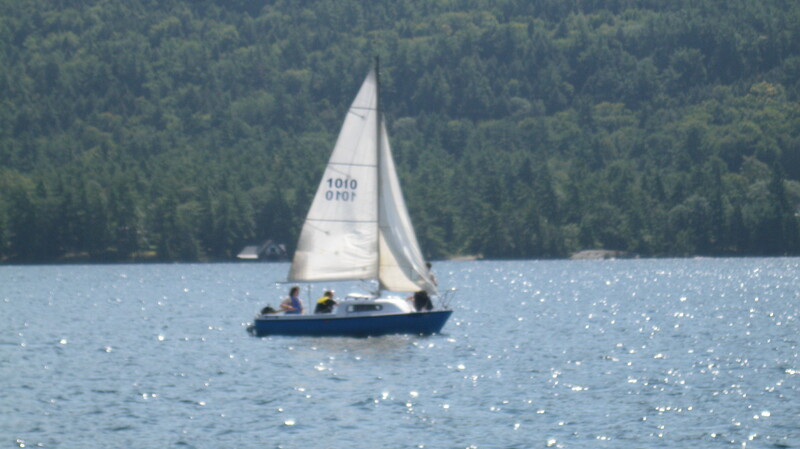 Sailing seems the perfect way to start the adventure. I read about Anna Brassey and her family who sailed RTW in 1876 on the Sunbeam, and about Joshua Slocum who sailed extensively with his family in the 1870’s and later RTW alone, and the Swallows and Amazons book series where the kids do a lot of lake sailing in the 1920’s, and this awesome Baltimore family of 5 who sailed RTW from 2003-2010. Unfortunately, even though I am proud part-owner of this little sailboat, I live in the 21st century with a limited budget and no sailing experience, so what’s a mama to do? I had to give up on the sailboat idea pretty quickly. Crossing the Atlantic by sail these days seems to be a private endeavor for those with a yacht, sailing experience, a skilled crew, and an ability to live in cramped spaces while dodging massive freighters and figuring out your position while dealing with all of those lines and winds. For all of Mr Fantastic’s optimism, and as much as I love him + our kids, I don’t believe I have the skills or temperament to survive in a small space with my family crossing a major ocean by sail. Also, I can’t help but notice we don’t have a yacht. I haven’t been able to find a situation where we could help sail someone else’s ship, since we lack skills and 4 of us are minors. So as I wandered through the internet, I found out about transatlantic cruises. I also found out about repositioning cruises. I am not a fan of cruises, but it got me thinking. Transatlantic cruises are one-way between the East Coast US and Europe. Since we plan to leave in early Autumn, our only option seems to be NYC- Southampton UK for 7 nights on the Cunard Line, also known as the White Star Line, yes, the people who brought us the Titanic! If that isn’t enough to deter us (and of course it’s not), the website photos all seem to depict distinguished retirees in formal wear (yikes!). I read in a comment section from a cruise-themed website that formal wear is required after 6pm. Entertainment includes the Royal Ascot Ball and the Royal Court Theatre and I’m sure lots of other Royal this and that. I could only find their limited kids programs when I really dug through the site. We would just be starting our 2-year low-budget RTW journey with 4 kids- sounds a little dicey to me, at least wardrobe-wise. The cost is about $1400 per person, hopefully less for kids. Flying NYC – London is about half that but we have to factor in the included week of room + board + entertainment on the cruise and the fact that I really want to go by sea. Not really our style but we might end up here! Repositioning cruises are also one-way and tend to have lower prices because they offer fewer amenities and may encounter less than optimal weather as they prepare for the tourist season. I got excited when I found an $800 Disney cruise from Texas to Barcelona, Spain for 14 nights, but dismayed to learn it leaves in May. Many of these cruises head West in Autumn, opposite of where we are headed. I even looked into Transpacific cruises but there are fewer and they are longer and more expensive, and of course we would have to get to California first. I have no love for Disney, BTW, as I explained previously, but the price looks great and I knew it would be more kid-friendly. Too bad about the schedule. And then Mr. Fantastic voiced a sudden opinion. Let’s drive to South America and get a repositioning cruise in March or April! I did not like it, but the man has great ideas sometimes and he is my travel partner so I entertained the thought. Like many of his surreptitiously wonderful ideas (Let’s live in a big city! Let’s have another baby! Let’s buy a sailboat!) maybe this would turn out great! I mostly disagreed. My impulse is just to get across the Atlantic and then keep going East and maybe get to South America on the return trip, or even in our post-RTW lives since it just doesn’t seem that far. But for love + marriage + adventure I considered driving through Central America. Except. I lived in Central America for close to 3 years and never once wanted a car. in fact, I rejoiced in not having one. For starters, there is cheap transportation available almost everywhere. Besides that, there are scary border guards, unreliable roads, language issues, repair headaches, gas prices, differing insurance and paperwork requirements, confusing maps + signage, I could go on and on. Upon further research, it appears that the Darian Gap, which separates Panama from Columbia, is a jungly, roadless, narcotics trade infested danger zone impassable by car. We decided we would have to fly from Panama City to Quito, since Ecuador is a place we have looked into living for a few months. The cost of this flight is about $500. For a bit more, we could fly from NYC to Quito and skip the drive through Central America altogether, so Mr. Fantastic has relented and perhaps driving is out. The South America thing might stick, though. I want to get across the Atlantic and to India and SE Asia where I hear there is much to do and affordable living, but I am interested in South America and I have never been there. Blogger Wandermom lived in Ecuador with her family for a time and made it sound pretty good. Mr Fantastic became excited about living in Asuncion, Paraguay and I have to say it also looks good. My zeal in getting to Europe might be misplaced – after all, South America has a lot to offer and I speak Spanish pretty well. And there is the 2-week $800 repositioning cruise from Brazil to Barcelona which would be a nice thing to look forward to while enjoying life south of the equator. Thus the debate continues. This entry was posted in RTW planning and tagged adventure travel, Anna Brassey, crossing the atlantic ocean, Cunard Line, family travel around the world, Joshua Slocum, round the world with kids, South America, transatlantic travel by trippingfantastic. Bookmark the permalink. I am with you on the sea journeys! And the non-ownership of a yacht. Darn. I have often thought that next time we move internationally we will take a one-way ticket on a cruise ship instead of a plane. (Planes are a bit dull.) I’m glad you’ve done some of the research for me there.